In truth, Sweetleaf Coffee hits shop excellence on every level. First, they use UNIQUE high quality espressos from Ritual, Sight Glass, and Stumptown. Most every coffee-aware shop here uses Stumptown and/or Counter Culture. This shop kept Stumpy on the back burner and went for espressos new to this coffee enthusiast. Eden, the barista, served up Ritual’s Primes espresso. It was fantastic. She explained, “It’s called primes because it’s supposed to have all the primary colors of espresso.” And what’s more, my double shot fit that description! There were very distinct high notes like a tart a fruity ness and a creamy body set apart like three individual pillars of flavor. Nice! The cappuccino was awesome, milk had perfect texture and the Americano was rich. Once invited behind the bar, Eden showed me why every shot comes out right. 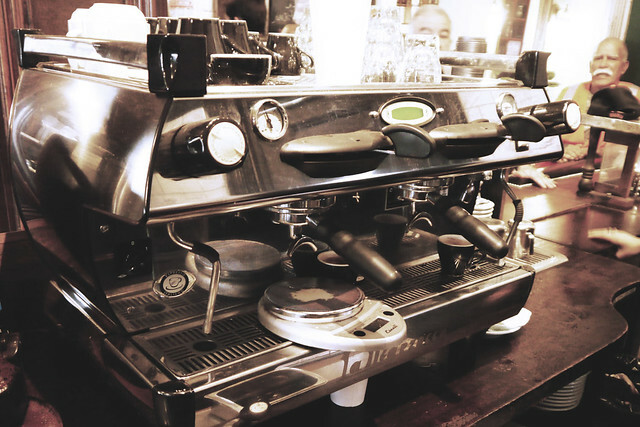 Sweetleaf measures each puck’s mass before it meets the espresso machine. Then, the mass of the shots are measured as they pull by a scale that rests on the drip tray of their espresso machine. Their parameters are tight and they make sure they get it every time. The bosses perform routine cupping to check the dose levels as well as determine the age at which each espresso matures to its full potential. Needless to say, they get a gold star for quality and consistency. But, honestly one gold star isn’t enough these days. Perhaps five years ago consistent espresso and impressive latte art would have been enough to stand out. With the push of the third wave, that is becoming standard. How does a shop differentiate themselves, now? My answer is environment, personnel, education and network. Sweetleaf’s layout maximizes the space for interaction and efficiency. First, a separate room for laptops. You wanna come to a PUBLIC place and pretend it’s a private office…fine. But you’ll have to do it with every other graphic designer in your own room. Then, there is the comfortable living room area for people who actually want to engage other humans while they drink this delicious stimulant. But, wait! That’s not all. So, you met a new friend and you want to share a more personal moment? Walk a few paces into the next room and you’ll have an opportunity in the awesome listening room. Bring your own records or use the one’s they provide. Share music…swap ideas. Big speakers, awesome wallpaper and comfy chairs. Suddenly, this isn’t just a coffee shop. It’s a crossroads, a community outpost, a cultural nexus — that is, if you have the personal depth to use it as such. These baristas…were they robots or angels? The perfect mix. Eden has a strong personality but knew the name and personality of each of her regulars. She took great care to answer all of my questions but had no problem giving me the vibe, “Enough questions, I gotta focus on my work.” After all, this is a blog post not a NYTimes cover article. Each of the regulars seemed at ease and traded some well-meaning jabs with Eden. That’s New York engineers for you. Gold star here, too. Eden took special care to answer her customer’s questions about the what, why and how’s of espresso served at Sweetleaf Coffee. Gold star. But, is this coffee shop involved with the greater coffee scene or just another insular “we do it best, forget the rest” coffee shop? Sweetleaf baristas regularly compete and frequently host the city’s monthly latte art competitions that draw baristas from several shops in the area. Perfect for swapping ideas and swagger. I hope to attend one of these evenings and see what it’s all about. Eden says there is generally a good turnout from many of the local coffee shops. So, Sweetleaf, you’ve got my respect. Your endeavors hit me on every level. Thanks for the coffee!